Finally, high-impact keyword ad campaigns – made easy. Designed specifically to reach shoppers while they are actively searching from their desktop or mobile device on Google, Shoptoit Keyword Ads are a proven way for you to expand your customer base and take advantage of the amazing returns delivered by long-tail keyword advertising campaigns. Shoptoit maximizes advertising returns by managing tens of thousands of words to reach shoppers while they are in the late stage, buy-mode, for a specific product. With Shoptoit Keyword Ads, you can benefit from long-tail campaigns without the need to spend money on hiring an agency, or spending the time to do it yourself. With Shoptoit’s product-priced based cost-per-click model, you only get charged when a shopper clicks through to your website for purchase. There are no setup fees, no management fees, no contracts and no monthly minimums. It’s never been simpler – Long-tail Product Ad campaigns are created automatically using the attributes (words) from your products. We create and manage all data feeds, categorization and targeting – driving quality traffic fromÂ Google AdWords. No agency required – you simply set your monthly budget and the Shoptoit platform manages the long-tail bids and campaigns to ensure maximum returns on your advertising investment. No management fees – Our cost-per-click model means you pay when qualified buyers click through to your website – all impressions are free. Our click rate varies based on the price of your product, earning you an exceptional ROAS (return on ad spend) at all times. See the results – You will receive a bi-weekly email with your results, and may login to your Shoptoit Merchant Services account at anytime to review reports and stats. Retailers experience significantly higher returns with long-tail keyword ad campaigns. The Shoptoit Keyword Ads program reaches buyers right at the point-of-purchase delivering exceptional returns. Retailers spend little to no time on management and there is no agency or internal resource required. Receive high quality traffic of new potential customers to your online store. 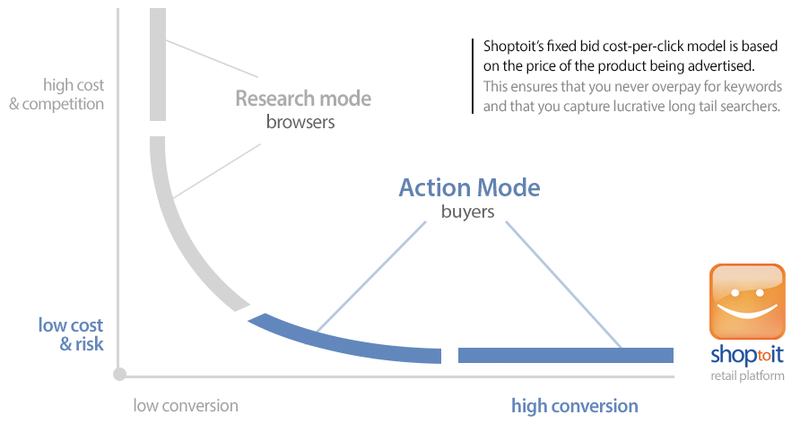 Many of these engaged buyers will immediately convert to customers delivering an exceptional ROAS (return on ad spend). Impressions are no-charge, you only pay for quality website visits. Your online store will be exposed to thousands of engaged online shoppers increasing you store branding and awareness for free.